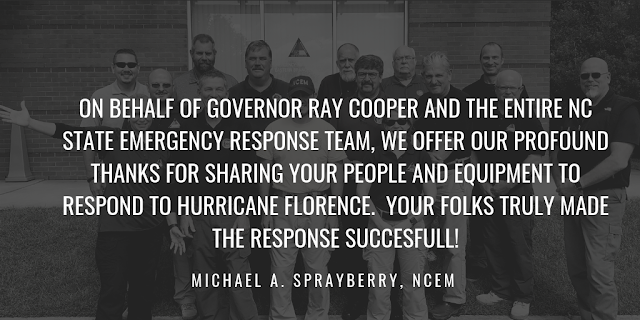 Director Mike Willis, Colorado Office of Emergency Management received the comments below from North Carolina following the deployments of an EOC Support Team, All-Hazards Incident Management Team and a Public Information Office to North Caroline to assist following Hurricane Florence. Taking a quick moment to reach out to you and, on behalf of Governor Roy Cooper and the entire NC State Emergency Response Team, offer our profound thanks for sharing your people and equipment to respond to Hurricane Florence in North Carolina. Your folks truly made the response successful! Due to the widespread nature of the event, additional resources were absolutely required. Thirty-one states answered our call and over 1000 personnel with various specialties were on the ground. All of the team members I spoke to were highly motivated and glad to be “in the fight” and making a difference…you should be proud. The EMAC program has once again proven its worth and demonstrates the best of America…States helping States! Thanks again for your leadership/partnership and for your support of North Carolina!"